The quantity of food, energy, and specific nutrients, such as protein, required by an elephant may also be crudely derived from the allometric scaling factor of body mass or weight W0 75. There are, however, difficulties in extrapolating this relationship all the way up (or down) to a herbivore as large as the elephant. Broadly, the elephant consumes less food and has lower nutrient requirements per unit of body weight compared to small herbivores (fig. 5.6). Its consumption and requirements, however, are higher than predicted by simple allometric scaling. The observed daily food consumption of 1.5%-2.0% (dry matter) of an elephant's body weight is higher than that derived from regressions for herbivores. Norman Owen-Smith uses a value of under 1% of body weight for African elephants; this is based on estimates by Richard Laws and team, who derived this from stomach fill and passage times. Field observations both in Africa and in Asia now clearly show these to be underestimates. Thus, the mass-specific food intake of an elephant is nearly comparable to that of a medium-size ruminant, although it is lower than for a nonruminant such as the zebra. This follows from the higher throughput rate of food possible in a nonruminant. The relationship between daily food intake (% of body mass) and body mass (kg) in several African herbivorous mammals. (Based on Owen-Smith 1988. 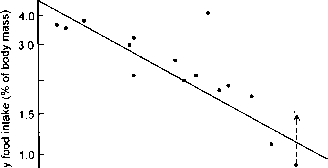 Reproduced with the permission of Cambridge University Press, U.K.) The value for the African elephant has been underestimated (arrow points to probable value); thus, the slope of the regression line would change slightly. by F. G. Benedict and later independently by C. R. Ananthasubramaniam, Tom Foose, and M. K. Hackenberger. When daily energy requirements of an animal are to be computed, at least three basic formulations must be kept in mind. Basal metabolic rate (BMR), proposed in 1947 by M. Kleiber, a pioneer in the field of animal energetics, is considered to be an exponential function of body weight described by the equation BMR = 70 x W0,75 kcal/day for placental mammals. Active metabolic rate (AMR), including normal activity such as foraging, movement, and resting, is usually taken to be a simple multiple (usually 2) of BMR. In addition, females incur energy costs associated with pregnancy and lactation, the latter being the more important according to O. T. Oftedal. This can again be taken as a simple multiple (e.g., 2.7) of BMR or computed from more complex formulations of milk production and energy yield. Using allometric equations in the literature, Keith Lindsay worked out energy and protein needs for adult elephants (table 5.3). As pointed out by Ellen Dierenfeld, however, balance trials such as those by C. R. Ananthasubramaniam indicate 50%-100% higher requirements of digestible energy for normal maintenance and activity compared to that derived from a generic Kleiber equation. Ananthasubramaniam found, in his balance trials, that adult Asian elephants need over 100,000 kcal of digestible energy daily; in contrast, a Kleiber function (140 x W kcal) for placental mammals gives values of only about 50,000 kcal for an adult female (say, 2,500 kg) and 70,000 kcal for an adult male (4,000-kg) elephant. Protein requirements in elephants may similarly be wrongly estimated if one were to go by allometric functions derived for comparisons across species. Daily requirements of adult elephants for metabolizable energy (MJ/day) and digestible protein (kg/day) using allometric functions. Sources: Lindsay (1994) and various literature sources. The allometric expression used in these derivations are 0.293W075 (for BM); 2 X BM (for AM energy); 0.00166W 075 (for AM protein); mean of various functions (for peak lactation energy); and mean AM X 0.01703W052 (for peak lactation protein). A problem is deciding whether such a function applies to an adult individual (and, if so, to a male or a female) or an "average"-size individual of the species. One formula used by K. G. McCullagh (based on D. B. Smuts) computes digestible protein requirement for body maintenance (active metabolism) as 1.76 x W ' g/day. For an adult elephant weighing 3,600 kg, this implies a daily need of 818 g of digestible protein. Assume that 50% of crude protein in plants is digestible and that an elephant weighing 3,600 kg consumes 72 kg (dry matter) plants daily (at 2% of its body weight). A diet of 2.3% crude protein would be sufficient for meeting the daily requirements, an extremely low figure. The balance studies of Ananthasubramaniam gave a figure of 2,370 g digestible protein daily for maintenance in an adult elephant (37 years old/3,600 kg). This translates into a diet of 6.6% crude protein, a more probable figure based on field empirical observations. For a subadult elephant (10 years old/1,337 kg), Ananthasubramaniam provided a figure of 1,300 g/day, which translates into a plant diet of nearly 10% crude protein. Putting all these data and formulations together, it can safely be assumed that a diet of 5%-6% crude protein is necessary for adult maintenance, and a higher figure is necessary for younger, growing elephants. Pregnant and lactat-ing cows would also need higher amounts. The crude protein level in plants needed for maintenance, of course, would vary with digestibility, an aspect that is still poorly understood. Digestibility could vary enormously with plant type and part, and this is important to a mixed feeder such as the elephant. Mineral nutrition in elephants has been a generally neglected subject. The key to understanding certain behaviors, such as feeding on bark or on agricultural crops, may lie in a better assessment of mineral requirements and the role of minerals in elephant dietary preferences. In the absence of specific data for elephants, Ellen Dierenfeld suggested that mineral levels adequate for horses, another hind-gut fermenter, should also be grossly suitable for elephants. She summarized these for adult maintenance as nutrient concentrations in forage (dry matter) of 0.1% for sodium and magnesium, 0.15% for sulfur, 0.2% for phosphorus, 10 mg/kg for copper, 40 mg/kg for manganese and zinc, 50 mg/kg for iron, and 0.1 mg/kg for selenium, iodine, and cobalt. Based on tusk growth rate in male Asian elephants between the ages of 10 and 30 years, I computed that this alone would need 1.7 g calcium daily. Based on human calcium needs, a 10-year-old male elephant (2,000 kg) may need an additional 16 g/day for normal metabolism. Similarly, a pregnant or lactating cow elephant may need about 60 g/day. Based on his balance trials, however, Ananthasubramaniam suggests a much higher calcium requirement for maintenance, computed as 0.5 g per unit metabolic body weight (kg ' ). An elephant may be prone to sodium imbalances according to the trials of F. G. Benedict with Jap and Robert Olivier on Malaysian elephants. These trials suggest that 75-100 g sodium may be needed by an adult elephant daily. concentration of 2,000 IU/kg and the vitamin D concentration of 300 IU/kg of plant forage (dry weight) needed by horses are adequate for elephants. Her work further showed that plasma retinol (vitamin A) values measured in zoo-bred African elephants were nearly twice those in Asian elephants. The low reproductive rate of captive elephants in most Western zoos has encouraged research on vitamin E requirements. The work of Ellen Dierenfeld and others suggests that zoo elephants may be prone to vitamin E deficiency. Levels of plasma a-tocopherol (vitamin E) in captive Asian elephants (mean of 0.54 ^g/ml) are nearly double those in African elephants (0.29 ^.g/ml). These levels suggest deficiencies as wild African elephants had much higher levels of a-tocopherol (0.8 ^.g/ml). Virtually nothing is known of requirements of the water-soluble vitamins. While on the subject of nutritive requirements of a herbivore, it is also appropriate to consider the imperatives of avoiding a variety of plant chemicals. After all, every plant contains protein, carbohydrates, lipids, minerals, and vitamins. 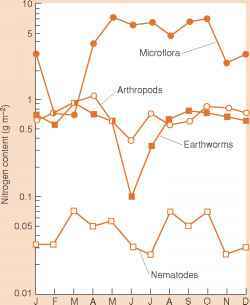 Why, then, do herbivores avoid feeding on a large number of plant species even if they are physically able to do so? The answer lies in the chemical defenses that plants possess to avoid being eaten. Broadly, these so-called plant secondary compounds have been categorized as quantitative and qualitative defenses. The quantitative defenses are compounds such as tannins, which reduce digestibility and are dosage dependent. Tannins bind to soluble proteins and render them inert to hydrolysis by protease enzymes. They have a characteristic astringent taste since they tan the proteinaceous mucosa and proteins of receptor cells in the mouth. About 80% of woody dicot plants are believed to produce tannins in varying quantities, in contrast to 15% of herbaceous dicot plants. The qualitative defenses or toxins, such as alkaloids and cyanogenic compounds, are present in smaller concentrations in herbs and weedy plants. They affect the physiological functions of the animal and may even be fatal if ingested in sufficient amounts. Herbivores can deal with these chemicals to a certain extent. Enzymes produced by microbes in the gut can detoxify many of these compounds, especially in ruminants, in which the stomach medium is alkaline. The same advantage may not be enjoyed by nonruminants, which have an acidic stomach; the elephant's stomach has a very acidic pH of 3.2. Herbivores can also detoxify compounds through other metabolic means, such as the microsomal enzymes in the liver. The observed diets of browsers such as the black rhino and elephants suggest that they may be able to deal with plant defenses no less efficiently than do the ruminants.